Stargazers are hoping for clear, dark skies tonight when the annual Leonid meteor shower will be at its best, but if Mother Nature spoils your show, you can always catch the celestial fireworks display live online. Scientists at NASA's Marshall Space Flight Center in Huntsville, Ala., will broadcast live views of the 2012 Leonid meteor shower online from an all-sky camera at the center. Clear weather is forecast during the event, center officials said. You can watch the Leonid meteor shower live here on SPACE.com via NASA. The webcast is expected to begin by 7 p.m. EST (0000 Nov. 17 GMT). The Leonid meteor shower occurs each year in mid-November when the Earth passes through a stream of debris left over by the comet Tempel-Tuttle. The comet orbits the sun once every 33 years and its meteor shower appears to radiate out of the constellation Leo, hence the shooting star display's name. This year, the peak of the meteor shower will occur in the wee hours of Saturday (Nov. 17), but meteors from the display should still be visible in the night before and after the peak. Because the moon is nearing its new phase, and will have set before the actual peak of the shower, the 2012 Leonids could impressive, NASA officials said. "The new moon will set the stage for what could be one of the best Leonid showers in years," they explained in a stargazing alert. In fact, the Leonid meteor shower has already been spotted by some eager stargazers, including night sky photographer John Chumack of Dayton, Ohio. 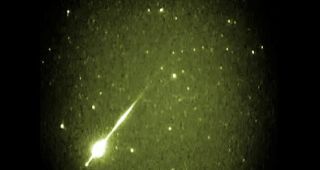 Chumack captured a video video of early Leonid meteors during an observing session late Tuesday (Nov. 13). "The annual Leonid meteor shower has begun! I have already captured a dozen or so last night via two of my night sky video Camera," Chumack told SPACE.com in an email. Get comfortable: Spotting meteors can sometimes require patience and a comfy reclining lawn chair or blanket can make hours of observing the night sky less of a strain on your neck. Dress warmly: A good jacket (or gloves depending on local weather) can be handy to ward off the November chill in the Northern Hemisphere. A cup of hot chocolate wouldn't be amiss, either. Get away from the city: Light pollution from city lights can diminish the number of meteors you may see. A clear, dark sky is essential to maximize your experience. While the Leonid meteor shower is typically one of the better meteor showers of the year, it is not the last celestial display of 2012. In December, the annual Geminid meteor shower will peak on Dec. 13 and 14. The Geminids are created by debris from the comet 3200 Phaethon and are typically the one of the most reliable and best meteor showers of the year. Editor's note: If you snap an amazing photo of the Leonid meteor shower and would like to share it with SPACE.com for a possible story or image gallery, send images, comments and location information to managing editor Tariq Malik at tmalik@space.com.